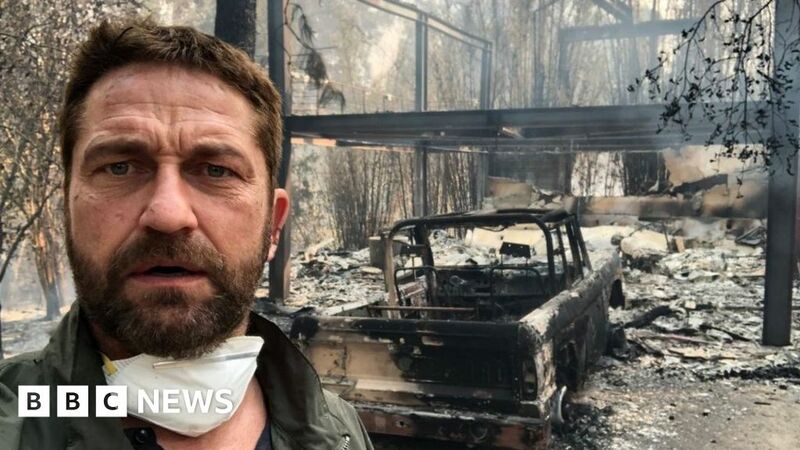 Gerard Butler and Miley Cyrus are among the celebrities whose homes have been destroyed by the deadly wildfires in California. The fires started on Thursday and have killed at least 31 people, with more than 200 people missing. An estimated 250,000 people have been forced to flee their homes. The singer and actress tweeted on Sunday that she and fiance Liam Hemsworth “made it out” of the fire safely. Cyrus also urged fans to donate money, time and supplies, and tweeted a list of charities and foundations working to support others affected by the disaster. The Scottish star of 300 and Gods of Egypt posted a photo of the remains of his Malibu home on Instagram on Sunday, thanking firefighters for their “courage”. In addition to the photo, Butler also posted two videos on his Instagram stories, saying that his house is “half gone”. Robin Thicke’s partner April Love Geary, who is currently pregnant, revealed on Instagram stories that their home had been destroyed. The fire also reached a ranch that has been the set of several films and TV shows. Paramount Western Town was built for TV productions in the 1950s and has recently been serving as a location for the first two seasons of Westworld. An HBO representative told the Hollywood Reporter that while “Westworld is not currently in production, the area has been evacuated,”. One of three structures within Villa De La Vina, has been destroyed, according to Entertainment Tonight. Kim Kardashian-West and her family evacuated their Hidden Hills home on Friday and had only one hour to pack their things. The reality mogul kept her fans updated through Snapchat and Instagram Stories, sharing photos of the blaze. Last night, she dedicated her People Choice Awards wins to the emergency services that have been dealing with the wildfires. Jenner evacuated her Malibu home on Friday, fearing it would be destroyed by the flames. However, the reality star told fans on Instagram on Sunday that that she was “one of the lucky ones” because her home had escaped the flames. The reality star has been living in the property since 2015 and it has often been featured on her reality show I Am Cait. The Pirates of the Caribbean star shared this view of his street to his 2.1 million followers on Instagram over the weekend. Lady Gaga also evacuated her home on Friday, writing several emotional tweets the next day. “I am thinking so deeply for everyone who is suffering today from these abominable fires & grieving the loss of their homes or loved ones.” she wrote. She also thanked the emergency services, calling them “true heroes”.